Ben Thompson was well on his way to a successful career working for a hedge fund company in Chicago, when he made a startling discovery: he really missed the radio business. Ben’s father, Scott, is the owner of Big Radio, a Monroe-based radio group that owns stations in Freeport, Lena, Monroe, Janesville and Beloit. Earlier this year, Big Radio purchased The Hog 105.9 FM in Janesville and WBEL-AM (The Big AM 1380) in Beloit and now owns eight stations in southern Wisconsin and northern Illinois. Big Radio broadcasts both WBEL and WGEZ, an oldies format, from their studios in downtown Beloit. Scott, who is a full-time lawyer, started in radio by broadcasting high school football games, before buying his first radio stations. By age 7, his son was on the air, lending a hand to his father’s morning show. “Every day my dad called me at 7 a.m. when I was getting ready for school,” Ben says, “and I would deliver the riddle of the day.” As he got older, Ben started hanging around the station, answering telephones and emptying trash cans. 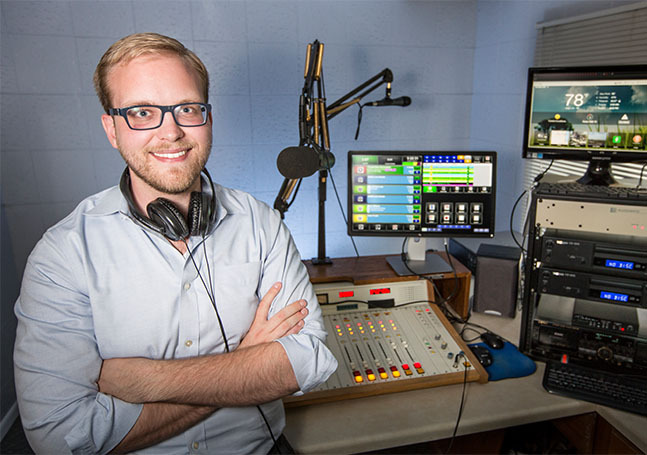 Ben got his first crack at hosting a morning show on the Freeport country station, WFPS-FM, during his senior year in high school. “I had a late pass for school every day,” he says, laughing. Ben graduated from DePaul University in Chicago, where he majored in finance and accounting. For 3 ½ years, he worked as an operations specialist at Magnetar Capital, an Evanston, Illinois-based hedge fund. But he missed the family business and moved to Beloit late last year.